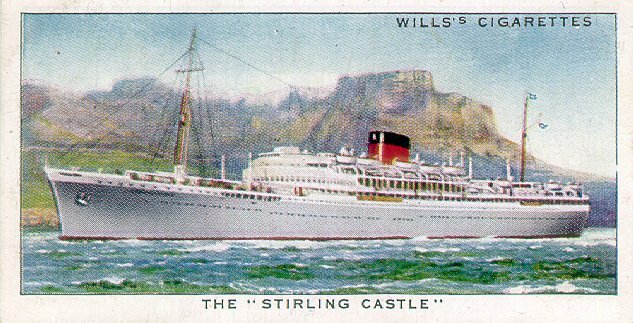 Launched at Harland & Wolff, Belfast, in July 1935, Stirling Castle made her maiden voyage from Southampton to Capetown on 7 February 1936. Six months later, in August, she made Southampton to Table Bay in 13 days, 9 hours, breaking the record (14 days,18 hours, 57 minutes) set by the Union Line's Scot in 1893. When World War II began, the ship was converted into a troop transport capable of accommodating as many as 6,160 men. By the war's end she had carried 128,000 soldiers and sailed over half a million miles in her wartime role. She was refitted for passenger service in 1946, and returned to Union-Castle's mail service in 1947. 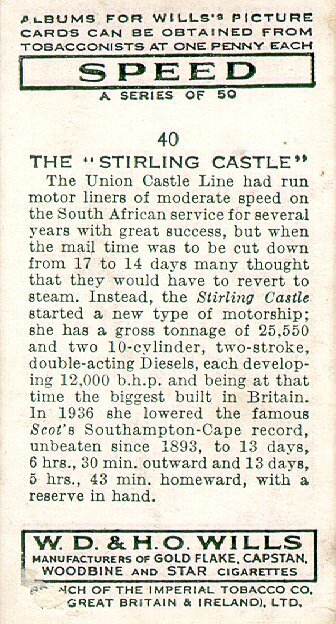 After her sale to Taiwanese scrappers fell through in 1965, Stirling Castle was broken up in Japan the following year. Sources: Haws' Merchant Fleets; Kludas' Great Passenger Ships of the World; Dunn's Ships of the Union-Castle Line.